All the Parks and Resorts love went to Orlando. Disneyland once again played second fiddle to its younger cousin across the country. Whether its because of the limitation of land or the upcoming 50th anniversary of Magic Kingdom where Walt Disney World all started, it seems most of the significant surprises announced at D23 Expo at the Parks and Resorts Presentation went to the East Coast. Disneyland did score one major announcement – Star Wars: Galaxy’s Edge will open first in Anaheim. But for how long will that be a West Coast exclusive? Bob Chapek, Chairman of the Disney Parks and Resorts, also confirmed what had long been just rumors – Guardians of the Galaxy: Mission Breakout! won’t be the only Marvel presence on the West Coast. Two other experiences featuring Spider-Man and The Avengers will be joining the Guardians to create a “Marvel Land” at Disney California Adventure. But Bob mysteriously did not refer to them as attractions but “experiences.” I hope that doesn’t mean a photo op or a meet and greet. Details were lacking. 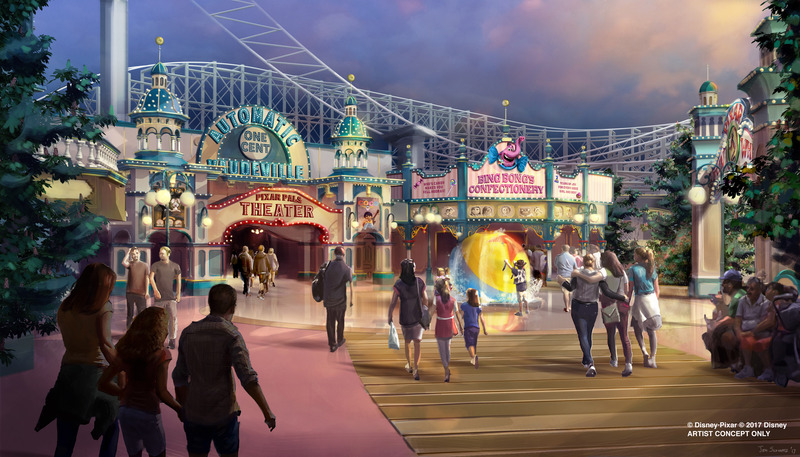 AT D23 EXPO 2017, DISNEY PARKS CHAIRMAN BOB CHAPEK ANNOUNCES PLANS FOR PIXAR PIER AT DISNEY CALIFORNIA ADVENTURE — During D23 Expo 2017, Walt Disney Parks & Resorts Bob Chapek unveiled plans for Pixar Pier at Disney California Adventure, where the pier will take on a brand new look as more favorite Pixar characters and stories come to life, from The Incredibles, to Inside Out to even more Toy Story. The only other Disneyland announcements were a Pixar makeover to Paradise Pier which will be renamed Pixar Pier and a Cars Land makeover for Halloween. Don’t go rushing to buy your tickets already! In the meantime, one of the hotels at Disneyland Paris is getting a makeover. The Hotel New York will be re-themed to feature the Marvel Universe. But will it be more than a glorified museum? Details again were lacking. And even though there have been major announcements about Tokyo and Hong Kong entering into multi-year expansions, almost nothing was said about it. A brief mention was made about Disneyland Paris’ 25th anniversary and Shanghai Disneyland’s 1st full year of operation, but other than that, it was pretty much the Walt Disney World show. It would be shorter to list what is NOT happening at WDW. Mission: Space at Epcot is reopening with a brand new “Green” adventure. Instead of being just a copy of the “Orange” experience with little to no movement, they described the revamped attraction as being “Soarin’ in space.” Eventually, there will also be a space themed restaurant attached to Mission: Space similar to Coral Reef Restaurant at the Seas Pavilion except obviously in space instead of underwater. And if that wasn’t enough, the France Pavilion at Epcot is getting the Ratatouille attraction from Disneyland Paris! Built in a whole new area behind the Eiffel Tower in Orlando, this E-ticket attraction will add even more excitement to Epcot. But what there’s more! A brand new Guardians of the Galaxy attraction will replace the current Universe of Energy. Sad news for Universe of Energy fans like me, but great news for the park. Will this ride add to the original concept of Future World at Epcot or is all of Epcot slowly being taken over to simply be another theme park? Bob Chapek announces the summer 2018 opening of Toy Story Land at Disney’s Hollywood Studios at Walt Disney World Resort. Mickey and Minnie’s Runaway Railway will be the first ever Mickey-themed ride-through attraction, with a new original story and lovable attraction theme song. Not to be outdone, Disney’s Hollywood Studios continues to add more E-ticket attractions revitalizing this once dynamic theme park. Set to open in Summer 2018 is Toy Story Land with two new attractions including a family-friendly coaster featuring Slinky Dog. Star Wars: Galaxy’s Edge will also be opening some time after its sister land opens at Disneyland. And under development is the first ever Mickey Mouse themed-attraction – Runaway Railway based on the new version of Mickey and friends instead of the classic look. Billed as 2 1/2-D, no glasses needed to enjoy the visual effects. The resorts weren’t left out at WDW either. Even though they just opened Copper Creek, a brand new DVC property called The Riviera will open and feature rooftop firework views of both Magic Kingdom AND Epcot. To make traveling between the new DVC resort and the other resorts even more fun is the announced installation of the Disney Skyliner. If you loved the Skyway as a kid, you’ll love this aerial transportation system that will let you travel between select resorts, Disney’s Hollywood Studios and Epcot. If that weren’t enough, a brand new Star Wars themed resort is being planned. Billed as something completely revolutionary, this immersive resort will make you feel that you have been transported to a galaxy far, far away. From the moment you enter to the moment you leave it will feel as if you were experienced LIVING on board a space station. On top of that, TRON: Lightcycles originally from Shanghai Disneyland are coming to Magic Kingdom in an area located next to Space Mountain. Wow. All that for Walt Disney World. And Disneyland? Gets a Halloween makeover. Wow. One of the neatest announcements at the Parks and Resorts Presentation was a sneak peek at the new Beauty and Beast stage show in development for Disney Cruise Line’s Disney Dream. Performers came out as if in rehearsal to perform “Be Our Guest” with images and video in the background of a behind-the-scenes look at how the show is being put together. Overall it was a great presentation, but as Disneyland is my first resort (and Walt’s! ), I have a special affinity for it and was disappointed not that so much was going to Orlando, but how little was happening at Disneyland. Still the future looks exciting for Disney theme park fans! For more on the Parks and Resorts Presentation be sure to check out my A Sorcerer’s Journey recap of it.